With the dedicated support of World Travel Online and CBN Travel & MICE, Cambodia Tourism Roadshow 2016 was kicked off in Shanghai, China on November 11, taking advantage of the release of 3-year multiple-entry visas by Cambodia government. H.E. Dr. THONG KHON, Minister of Tourism of Cambodia, presented at the Roadshow to promote the abundant tourism resources of Cambodia, aiming at attracting more Chinese tourists. With the attractive and impressive speech delivered by Dr. THONG KHON, more than 100 Chinese travel trade decision-makers, 20 investors and 10 media enjoyed a wonderful journey to the “Kingdom Of Wonder”. H.E. So Visothy, Under Secretary of State of Tourism of Cambodia, shared their vision with enthusiastic attendee: Cambodia is expected to attract 7 million international tourists, among whom 2 million are Chinese tourists, generating a revenue of 5 billion dollars. With the exquisite PPT, H.E. So Visothy also expounded the development potential of Cambodia tourism. Cambodia was consecutively awarded the “2015 Travelers’ Choice” by TripAdvisor and the “Ultimate Travel Destination” by Lonely Planet. International tourist arrivals to Cambodia are growing year by year, reaching 4.8 million in 2015 and 3.2 million in the first eight months of this year. Cambodia tourism generated a revenue of 3012 million dollars in 2015, contributing 13% of GDP. Cambodia tourism has grown up to 14.1% from 2009 to 2015. H.E. Dr. THONG KHON’s personal attendance showed his emphasis on Chinese market. The presentation given by H.E. So Visothy aroused the attendee’s interests in the Kingdom of Wonder. At the mention of Cambodia, it’s apt to think of the Angkor Wat, one of the eight wonders in the world, and the Ta Prohm Temple where the films Tomb Raider and In the Mood for Love were filmed. H.E. So Visothy listed some must-sees and must-dos in Cambodia, including the nightlife in Phnom Penh, the stunning beaches in Sihanoukville, the diver’s paradise of Song-saa Private Island, the exploration of the various wildlife, the graceful spectacle of Apsara Dance, the interesting puppet show, the Khmer Boxing and the Cambodian spa, among others. Mr. Feng Litao, Deputy Director General of China National Tourism Administration, presented the Roadshow and delivered a wonderful speech. Almost 10 media interviewed the representatives of Tourism of Cambodia in good order. The Chinese tourism professionals immediately started conversations with over 10 tour operators and hotels from Cambodia, lest chances be grabbed by others, for knowing that China became the second largest tourism source to Cambodia in 2015 with nearly 700,000 tourists, and the Chinese tourist arrivals to Cambodia in the first quarter of this year soared to 217,000, up 16.1%. Cambodia offers visa on arrival, e-visa and 3-year multiple-entry visa, which plays a positive role in attracting Chinese tourists visiting Cambodia, thereby making China be the largest tourism source to Cambodia this year. Many Chinese travel trade decision makers showed their intentions in cooperation with tour operators and hotels from Cambodia. Cambodian tour operators answered many questions raised by curious attendee. Union Development Group, Naga World Hotel, Sokha Hotel and Resort, Tourism Development Co., Ltd by YEEJIA, etc. are excellent cases of Cambodian tourism projects invested by Chinese investors. The representatives of these enterprises shared their secrets of success unsparingly in the Roadshow. Cambodian investment promotion agencies presented a wide range of investment opportunities to Chinese investors, such as tourism products and services, international resorts and hotels, entertainment complexes, conferences and exhibitions, theme parks, human resource development and training institutions, tourism management, infrastructure development and other high-quality and diversified tourism investment projects, arousing the interests of Chinese investors. During the roadshow, many attendee would like to take this opportunity to learn more about the chartered airplane and aviation network between China and Cambodia. Cambodia Angkor Air, China Eastern Airlines, Southern Airlines, Air China, Spring Airlines and other large airlines provide many flights connecting Phnom Penh and Siem Reap with major cities across China, including Beijing, Shanghai, Guangzhou, Hong Kong, Macao, Taiwan, Chongqing, Xi’an, Kunming, Wuhan, Nanning, etc. Besides, many new routes will be opened in the near future. With the advantage of ASEAN, cruise tour and self-driving tour have become more and more popular in recent years, bringing opportunities to Cambodian tourism. Lots of tourists choose to experience ASEAN countries by cruise or car. Representatives from the Tourism of Cambodia and enterprises, together with other attendee from Chinese travel trade, enjoyed a superb dinner and splendid Cambodian dancing performances, and had a wonderful Cambodian night. Assisted by World Travel Online, Jamaica Tourist Board has partnered up with Jamaica Hotel and Tourist Association for a fam trip activity for travel tour operators from China to the Islands from January 26 to February 2. 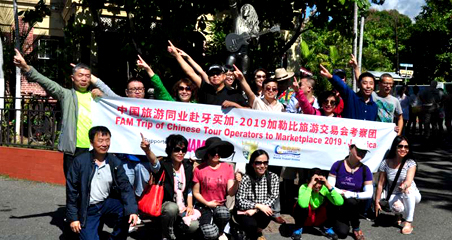 Apart from the itinerary to visit attractions and hotels, the Chinese delegation was invited to attend Caribbean Travel Marketplace and China �C Caribbean Tourism Forum to enhance the bilateral exchanges with service providers in the Caribbean. 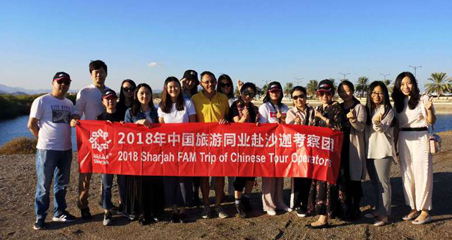 Sharjah Tourism Authority invited 15 tour operators from China for the Fam trip in December 2018. The trip, lasting from 14 to 18 December, brought the delegation to enjoy the new local experiences, reflecting the Sharjah's features. Delegates said that Sharjah''''s tourism resources are unique and will improve the experience of Chinese tourists. 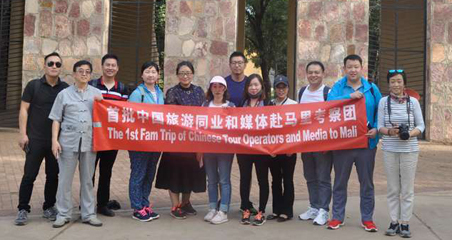 Ten important Chinese outbound tour operators and media took part in Mali’s first ever fam trip, giving them a firsthand view of travel destinations in Mali.This project will provide an ideal opportunity to raise awareness among agents, so they are confident and able to sell the destination effectively in China.